CAUTIOUS!!! Dangerous teether & toys for babies. Please share with friends with babies. Bought this teether from a supermarket. 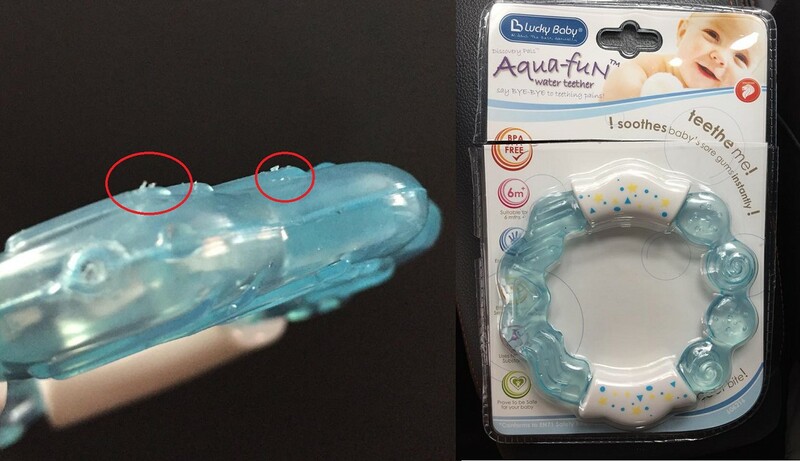 I washed it and just before giving to my baby realised there are some small sharp parts that can pose HUGE DANGER to baby especially when they bite hard with their soft gums. I tried sliding it across my hand. It caused a scratch and it was very painful. I thought it might be just this particular teether that I bought. I called up the company to inform them so that they can check and recall back this product if the whole shipment is affected. To my surprise they brushed me off until I say I will post this on social media to warn mothers about the danger of this toy. Then they ask me to bring back so that they can refund me. After 2 weeks, I went to their warehouse at ChaiChee. The staff who picked up my call asked me to show her where is the faulty part. I ask her to check and tell me instead but she kept insisting that there is no issue and then asked me to wait before she went into their office. After 10minutes, she came out and asked me for receipt. I ask her she cant recognise her own company product is it? I wasn’t there for refund if not I would have gone back to the supermarket that is just few minutes away from my house. Why take the trouble? Then she still insist there is no fault with the teether and is with their “boss”. They are processing the refund because I was not happy with the product. I then request to speak to the “boss”. He came out and then finally admitted that indeed it was faulty because I use the sharp corners to run through the back of his hands lightly and created 2 scratch marks. I told them the reason we are taking the trouble of spending precious weekend family time, petrol and parking fees just so that we can prevent injuries in other babies. They were still selling this item in their own warehouse store. I checked one of the exact same teether hanging in the store. It also got the similar sharp part. To my disappointment, they admitted that after my call, they did not do any follow up. I told the “boss” since they are not doing anything then I should post it on social media to share with mothers to watch out for potential danger in the toys given to their babies stating this as example. Then the “boss” said they will look into it but told me even if there are any mishap they have all the certification to cover them. Their products has gone through tests and obtained certification so they are not worried. I asked for my pathetic $5.90 refund and left the item with them. They can do whatever they want with it and I will create the awareness myself by posting this. Hope this will prevent any babies from getting injured. It is not about any company or any product but really is about baby’s safety. It might look like a small issue but when baby gets injured, it is huge to any parent.